Sweet Brandy joined OBG in November 2013 after being found as a stray in Virginia. She was an affectionate, petite beauty who loved to be near her humans and got along with other dogs and cats. She went to her forever family in mid March and it was such a happy day. She had a great first three days together but on the fourth day she seemed unusually lethargic. Tests showed Brandy had become severely anemic and an abdominal ultrasound revealed cancer throughout all the lymph nodes in her abdomen. Her new family and OBG were heart broken to have to say goodbye to her so quickly. 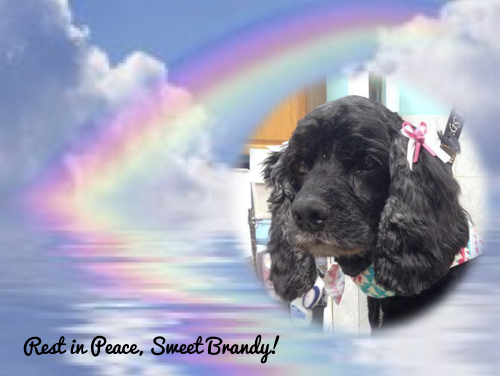 Brandy went peacefully to the Rainbow Bridge on March 18, 2014. Our hearts go out to her forever and foster familes for their loss. Rest in peace, Sweet Brandy! You will be forever in our hearts!